“Never waste any amount of time doing anything important when there is a sunset outside that you should be sitting under!” – C. JoyBell C.
The close of another wonderful summer month. Amazing sunset over Plymouth Harbor, perfectly calm with true reflections on the water like glass. The colors blended perfectly from deep orange on the horizon to a deep Cobalt in the upper sky. Difficult to achieve a graded wash in this sketchbook. Holbein and Mission Watercolors, Black Pitt pens and a white gel pen in a Stillman and Birn Sketchbook. I sketched the Slater Mill in January from the other side with snow on the roof in black and white. 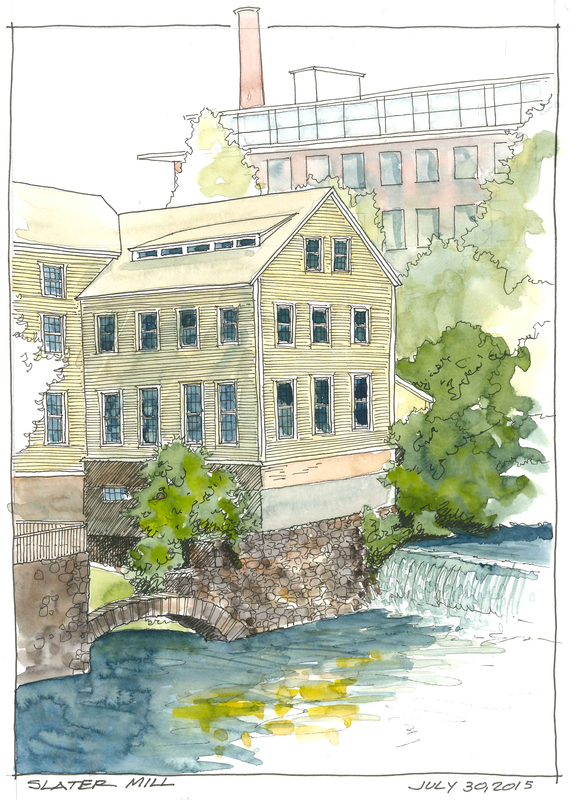 I thought I would try a view from the Blackstone River with color. Modeled after cotton spinning mills first established in England, the Slater Mill is the first water-powered cotton spinning mill in North America to utilize the Arkwright system of cotton spinning. Construction of the machines, as well as a dam, waterway, waterwheel and mill was completed in 1793. 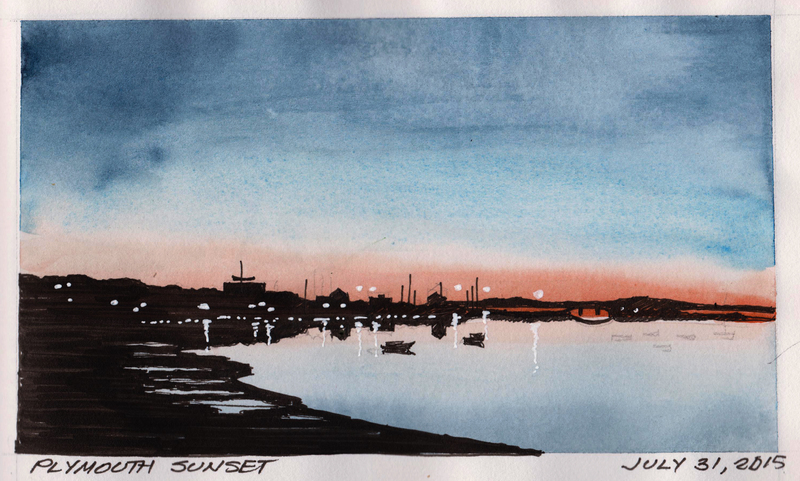 Pen and Ink sketch using FB Pitt pens with Holbein and Mission watercolors in a Stillman and Birn Alpha Series Sketchbook. The Black Eyed Susans are at their peak in our yard. They are such bright and cheerful flowers and we look forward to them every year. 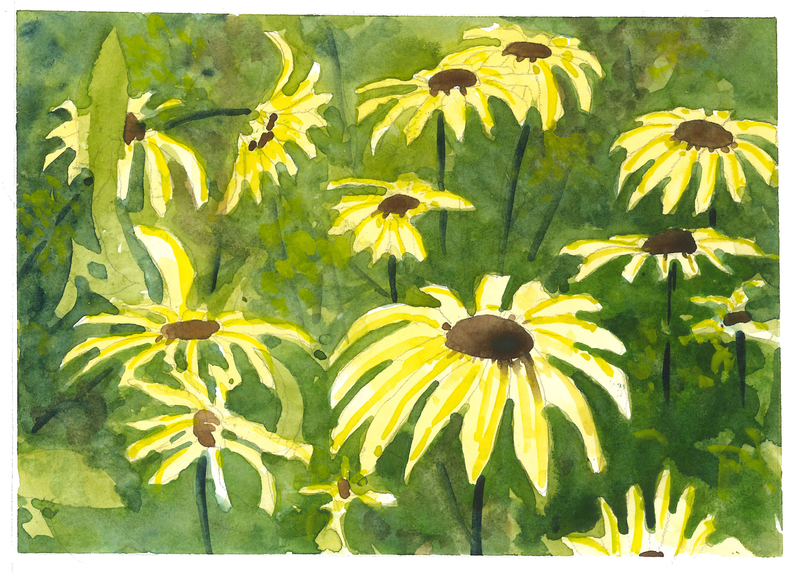 Black Eyed Susans (Rudbeckia hirta) are native to North America and one of the most popular wildflowers grown. They tend to blanket open fields, often surprising the passer-by with their golden-yellow beauty. Members of the sunflower family, the “black eye” is named for the dark brown-purple centers of its daisy-like flower heads. The plants can grow to over 3 feet tall, with leaves of 6 inches, stalks over 8 inches long and flower diameter of 2 to 3 inches. 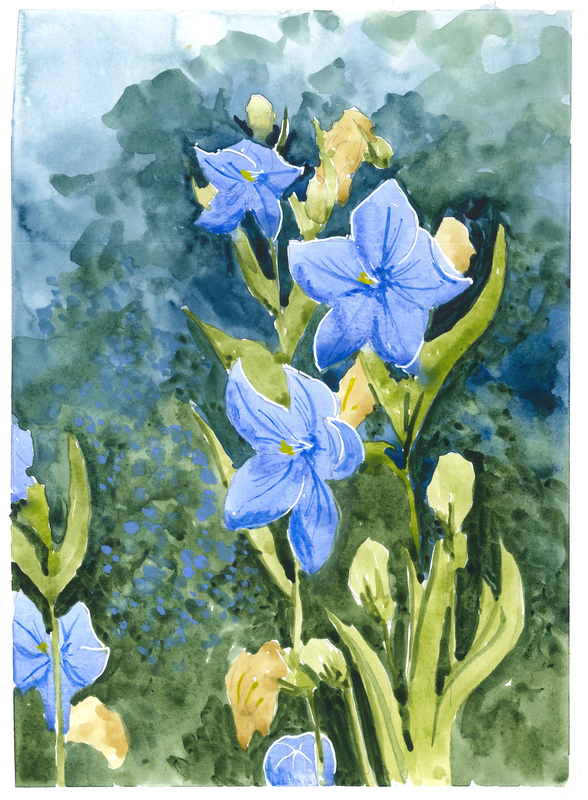 Holbein Watercolors in a Stillman and Birn Alpha series sketchbook. The Soldier’s Memorial Library is a historic library building on the town green at the junction of Park Row and Union Street in Mansfield, Massachusetts/ The 2-1/2 story Gothic Revival structure was designed by the noted Architectural firm of Peabody and Stearns, and built in 1899-1901. The building and land were primarily a gift from Elizabeth F. Noble. It was designed to house the public library on the ground floor, and provide a memorial to the town’s American Civil War soldiers on the upper floor. The building was listed on the National Register of Historic Places in 1995. The building currently houses the school administrative offices and is connected to the Town Hall. Faber-Castell Pitt Art pens in a Stillman and Birn Sketchbook. 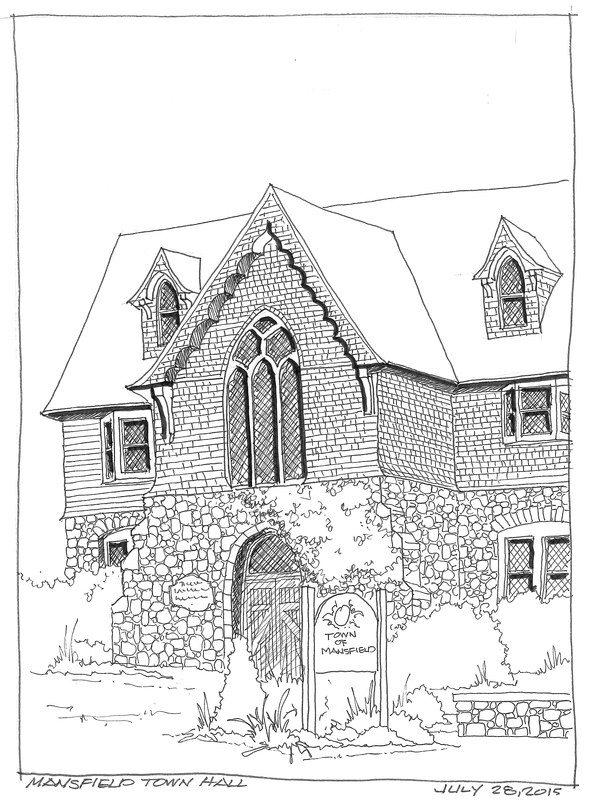 The Church of the Messiah is located in the beautiful quaint village of Woods Hole, Massachusetts. 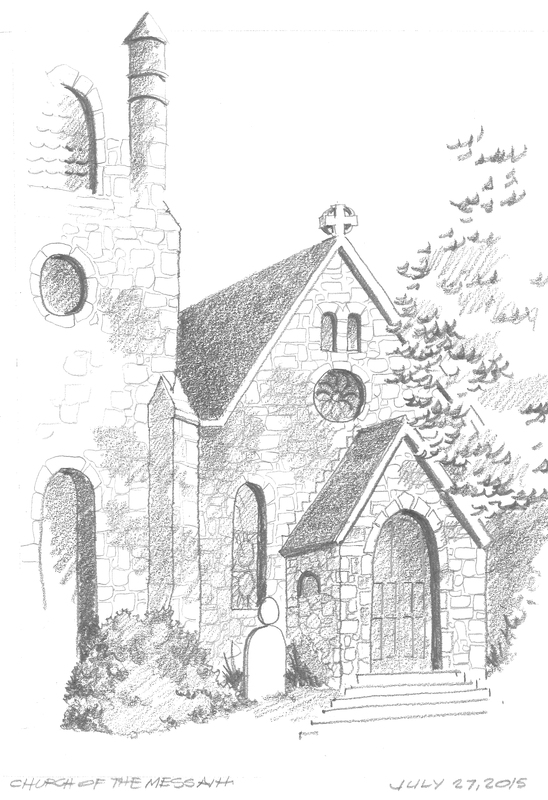 The granite, Gothic-style church that stands beside Little Harbor is home to Cape Cod’s oldest Episcopal parish. The church, which was constructed in 1888 and consecrated on July 2, 1889. Back to practicing with pencil for tonal a study. Koh-I-nor solid graphite 6B pencil in an Alpha Series Stillman and Birn Sketchbook. The flowers are amazing this time of year, especially on Cape Cod. It must be the cooler nights and the salt air moisture. 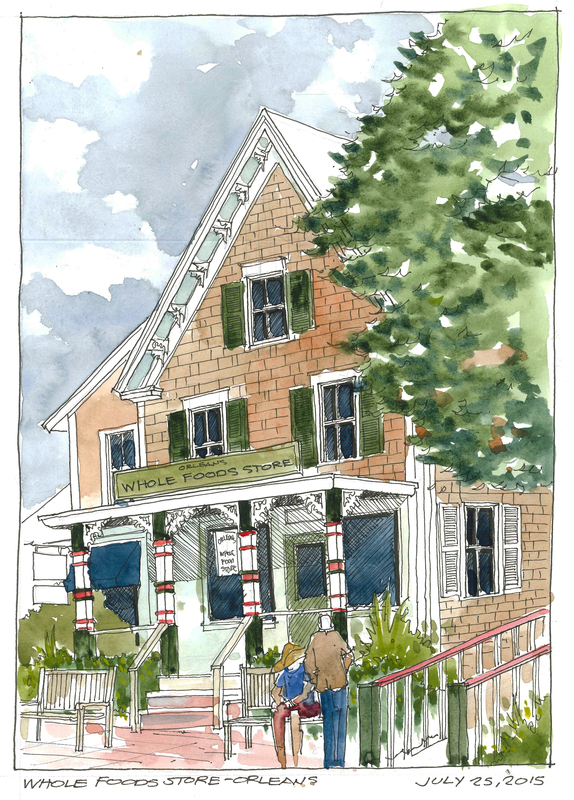 This watercolor sketch is actually of one of the beds adjacent to yesterdays sketch of the Whole Food Store. The flowers are Blue Vine Flowers and Lavender. The lavender is so abundant on the cape this year. Maybe I am just noticing it more this year. Whole Food Store – Not to be confused with the large chain Whole Foods. This is a Natural Food store in the center of Orleans, MA. Faber-Castell Pitt pens and Watercolor in a Stillman and Birn Sketchbook.